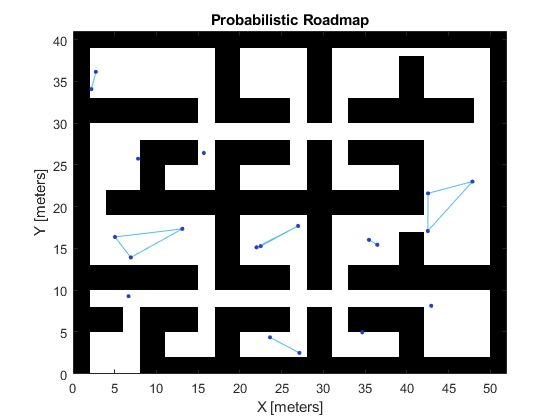 This example demonstrates how to compute an obstacle free path between two locations on a given map using the Probabilistic Roadmap (PRM) path planner. 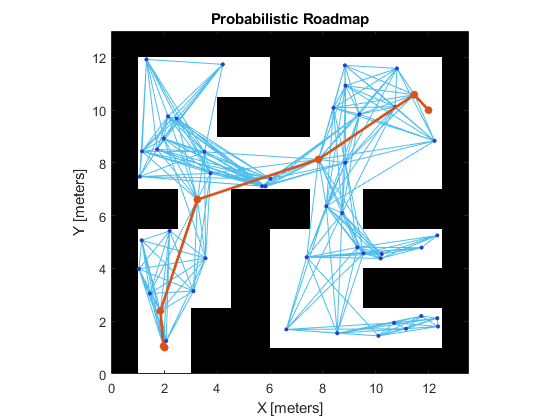 PRM path planner constructs a roadmap in the free space of a given map using randomly sampled nodes in the free space and connecting them with each other. Once the roadmap has been constructed, you can query for a path from a given start location to a given end location on the map. In this example, the map is represented as an occupancy grid map using imported data. 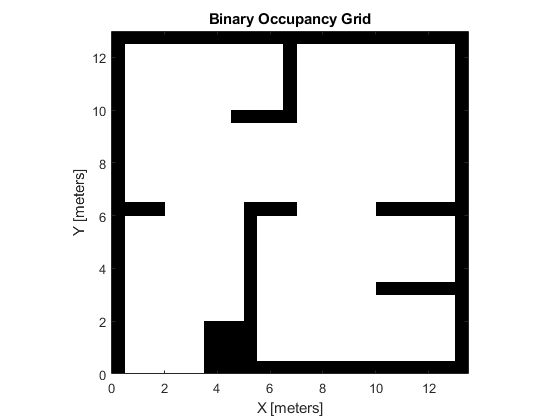 When sampling nodes in the free space of a map, PRM uses this binary occupancy grid representation to deduce free space. Furthermore, PRM does not take into account the robot dimension while computing an obstacle free path on a map. Hence, you should inflate the map by the dimension of the robot, in order to allow computation of an obstacle free path that accounts for the robot's size and ensures collision avoidance for the actual robot. Define start and end locations on the map for the PRM path planner to find an obstacle free path. The imported maps are : simpleMap, complexMap and ternaryMap. 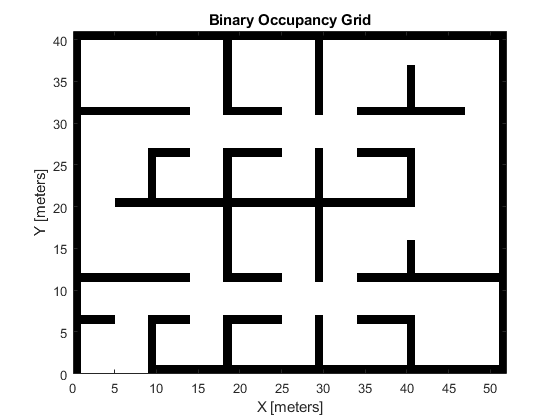 Use the imported simpleMap data and construct an occupancy grid representation using the robotics.BinaryOccupancyGrid class. Set the resolution to 2 cells per meter for this map. To ensure that the robot does not collide with any obstacles, you should inflate the map by the dimension of the robot before supplying it to the PRM path planner. Here the dimension of the robot can be assumed to be a circle with radius of 0.2 meters. You can then inflate the map by this dimension using the inflate function. As mentioned before, PRM does not account for the dimension of the robot, and hence providing an inflated map to the PRM takes into account the robot dimension. Create a copy of the map before using the inflate function to preserve the original map. Now you need to define a path planner. Create a robotics.PRM object and define the associated attributes. Define the number of PRM nodes to be used during PRM construction. PRM constructs a roadmap using a given number of nodes on the given map. Based on the dimension and the complexity of the input map, this is one of the primary attributes to tune in order to get a solution between two points on the map. A large number of nodes create a dense roadmap and increases the probability of finding a path. However, having more nodes increases the computation time for both creating the roadmap and finding a solution. Define the maximum allowed distance between two connected nodes on the map. PRM connects all nodes separated by this distance (or less) on the map. This is another attribute to tune in the case of larger and/or complicated input maps. A large connection distance increases the connectivity between nodes to find a path easier, but can increase the computation time of roadmap creation. Define start and end locations on the map for the path planner to use. Search for a path between start and end locations using the findpath function. The solution is a set of waypoints from start location to the end location. Note that the path will be different due to probabilistic nature of the PRM algorithm. Update PRM object with the newly inflated map and define other attributes. Set the NumNodes and the ConnectionDistance properties. Define start and end location on the map to find an obstacle free path. Search for a solution between start and end location. 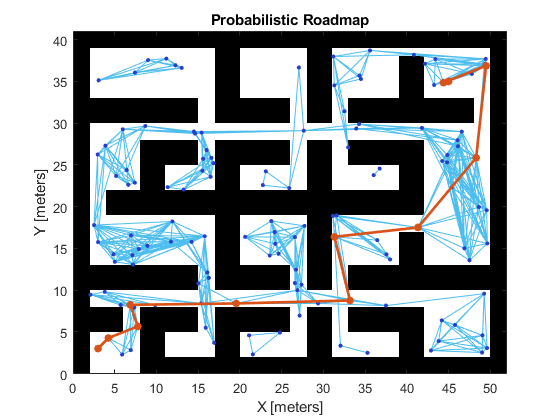 For complex maps, there may not be a feasible path for a given number of nodes (returns an empty path). Since you are planning a path on a large and complicated map, larger number of nodes may be required. However, often it is not clear how many nodes will be sufficient. Tune the number of nodes to make sure there is a feasible path between the start and end location. Construct a robotics.OccupancyGrid object using the imported ternaryMap data. The ternaryMap represents an environment using probabilities, where the probability of occupancy for free space is 0, for occupied space is 1 and for unknown space is 0.5. Here, the resolution of 20 cells per meter is used. Update PRM object with the newly inflated map and define other attributes. PRM uses FreeThreshold on the OccupancyGrid object to determine the obstacle free space and computes a path within this obstacle free space. The value of unknown cells in the ternaryMap is 0.5, while the default FreeThreshold on OccupancyGrid object mapInflated is 0.2. As a result the PRM will not plan a path in the unknown region. Search for a solution between start and end location. Continue to add nodes until a path is found.